Grazie, Autunno! The arrival of pumpkins in all their guises at the market is another reason to celebrate the start of fall. 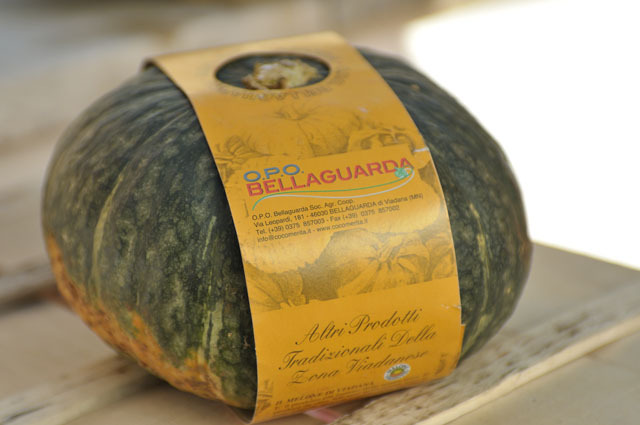 The best Italian pumpkin is to be found in the Mantua province, located in northern Italy, about halfway between Milan and Venice and just above the super-food territories of Parma and Modena. This is where the Alps tumble down onto the wide Padana plain, and the climactic conditions are clearly just so for growing rice and pumpkin. Ravioli di Zucca is the must eat dish of this area, the pumpkin filling is intense and sticky inside, with just a hint of crushed amaretto biscuits, tucked in satiny home-made pasta and served in butter and sage. 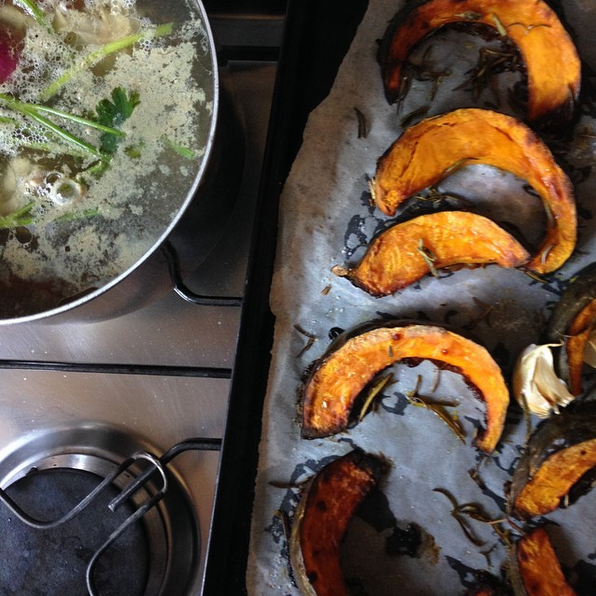 Kind and fortifying food for the cooler months. The large bright orange pumpkin sold around the average Roman markets is instead only occasionally used in the kitchen, while predominately valued as excellent pig feed. These garish orange Zucca Napoletana are very large, watery and sort of squashy, a bit like your classic Halloween lantern type pumpkin – which is probably why Americans started making lanterns with them instead of eating them in the first place. Romans themselves say disparagingly ‘non valgono niente’, or, “they are not worth anything”. But at the farmers’ and the better local markets around Rome you will find dark skinned Zucca Mantovana with its rich golden flesh; and lovely pale butternuts. A comforting pumpkin risotto is what I love to cook as soon as leaves begin to turn gold. The Northern Italians really understand the concept of risotto and the wonderful rice variety Vialone Nano is also grown around Mantua. Northerners use plenty of butter, the best quality Vialone Nano or Carnaroli rice, know their brodo stock, and take the necessary time to stir. As risotto is a delicate construction of flavors, a home made chicken or veal stock is necessary to a rich satisfying result. Throw a few pieces of chicken or a carcass into a pot with an onion, carrot, stick of celery and a couple of peppercorns, cover with 2 litres of water, bring to a boil and let simmer for a couple of hours. While the stock is simmering roast diced pumpkin in the oven with a couple of cloves of garlic, some rosemary, salt and extra virgin olive oil. The roasting accentuates the flavor of the pumpkin, bringing out all the sweet nuttiness. Preheat oven to 200° C (390° F). 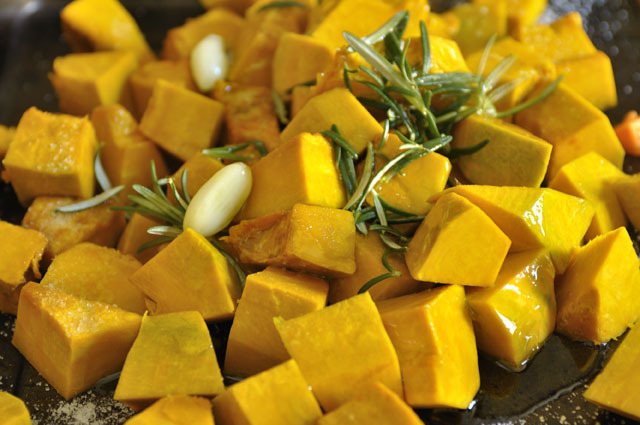 Dice pumpkin, toss in olive oil, chopped rosemary needles and 2 garlic cloves, season with salt and place in the hot oven to roast for approximately 30 minutes. Finely dice onion and fry off (with a little pancetta if you like) in olive oil in a large heavy based saucepan. Once onion has softened, add 1 clove of squashed garlic and the rice to the pan. Lightly toast the rice, and then add half a cup of white wine to deglaze the pot. Begin adding the warm stock ladle by ladle, stirring constantly with a large wooden spoon. Move the rice around the pan so that it doesn’t stick and so that it all gets the same access to heat and stock. About three quarters of the way through the cooking process add the roasted pumpkin to the risotto and stir to mix well as it continues to cook. The final moments in the cooking process are crucial. Once the rice has cooked al dente it is time to finish the risotto. Add a couple more ladles of stock so that the rice mixture is nice and liquid and then add the chilled butter. Stir well so that the liquid and butter amalgamate and take the pot off the heat. Add freshly grated Parmigiano and salt and pepper to taste. The kids will love it so it’s a brilliant way to get all those wonderful orange nutrients onto the table. 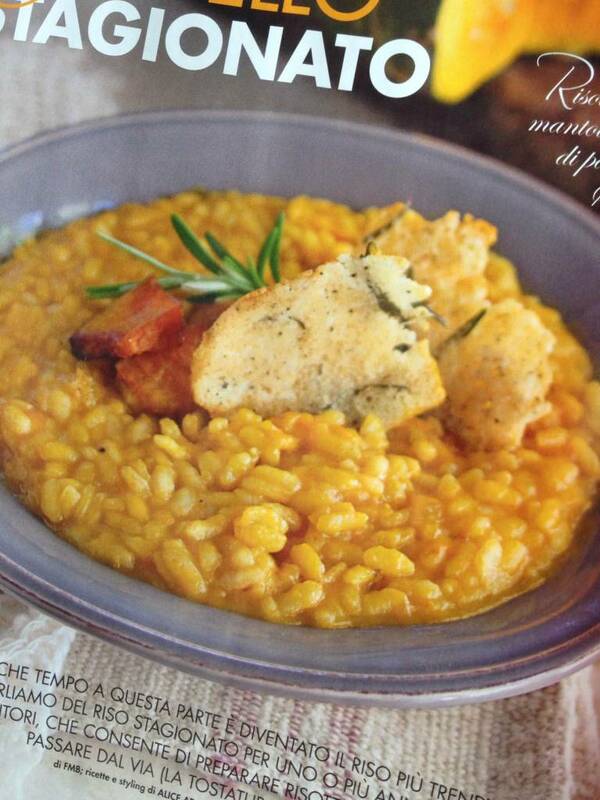 And for anyone who would like to read the recipe in Italian, you can find my recipe in this month’s Alice Cucina. Alice Adams, cook, food writer and stylist, moved to Rome in 2005 to learn more about regional Italian culinary traditions; the stories behind the food in each part of Italy that give local food its legitimacy and cultural importance. Alice loves sharing the Roman food experience with visitors; piecing together seasonal produce, local agricultural traditions and historical reasons behind the food. She has a degree in Art History and her eyes are always open to Rome’s beauty as she walks the cobbled streets in search of the city’s best. Oh what a wonder! Thank you dear Alice for sharing your precious knowledge on Italian variations of pumpkins with us. 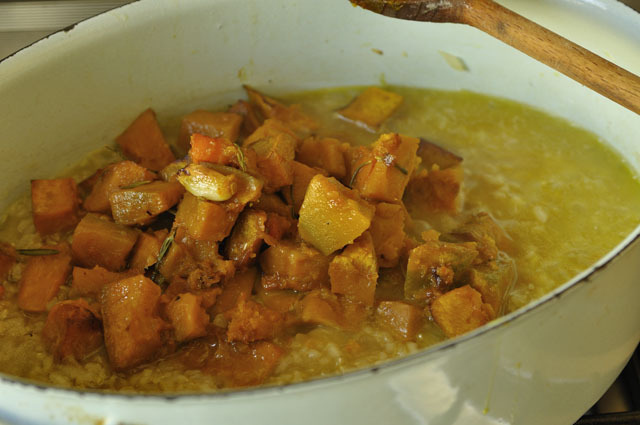 Personally I LOVE butternut squash and kabocha. I wish I could have that beautiful risotto for lunch right now.